Development of novel functionalizable materials based on graphene and carbon nanotubes including their optimization and characterization. These materials are used on field effect transistors in order to selectively detect different hazardous substances. This also implements the adaption and improvement of different electrochemical methods for materials characterization. In parallel to these sensors (for the liquid phase), we are currently working on the improvement of different smell sensing concepts, which should lead to the development of a chemical nose. The fast and accurate on-site detection of different contaminants is highly important in various scientific and industrial settings. The main advantage of this approach is the avoidance of cost intensive laboratory equipment and personnel. In order to make this possible, a target-focused optimization or a re-development of suitable measurement concepts is carried out at CEST. Examples thereof are e.g. the quantification of pharmaceutical residues in rivers, the detection of clinically relevant (tumor-)markers as well as the determination of different toxins in food and feed. A wide range of different measurement systems are available at CEST and can be tailored to a wide range of applications. Within the emerging field of bioelectrochemistry, CEST is focusing its research activities on the development of artificial electrochemical biomimetic sensor concepts for the quantification of biomedical and environmental target molecules. 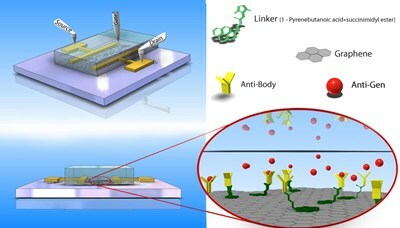 The development and optimization of such biosensors offers several benefits, such as improved detection limits of small molecules, the specific analysis of hazardous samples as well as possibilities for the passivation of sensor surfaces in order to improve their lifetime and sustainability. In the wide field of sensors, our core competence is the fabrication and implementation of graphene and its derivatives in sensor platforms. 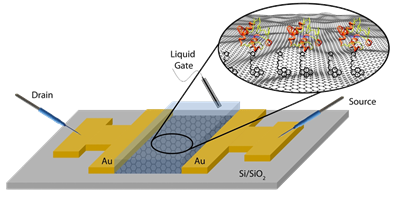 Based on this concept, different biomolecules which serve as biorecognition elements (“detector”), are immobilized on the sensor surface. This leads to a measurable electrical system change in case of binding events. After each development, the different sensing concepts undergo an in-depth evaluation under real life conditions in order to ensure their suitability for the desired applications. Based on several multilateral projects, we already discovered different processes to fabricate new sensor types and concepts. This research is used as basis for the development of tailor-made solutions for our industrial partners and offers a wide range of different solutions for the detection and reduction of hazardous substances and is therefore directly linked to safety issues. The combination of our know-how achieved by fundamental research and our experience to transfer results in solutions for industrial problems, we are the perfect partner which can offer a wide range of solutions and cooperation networks in order to achieve fast and effective results based on the desired needs in all different projects. Within our projects, CEST works in close collaboration with experts from the AIT, Vienna University of Technology and the University of Vienna.